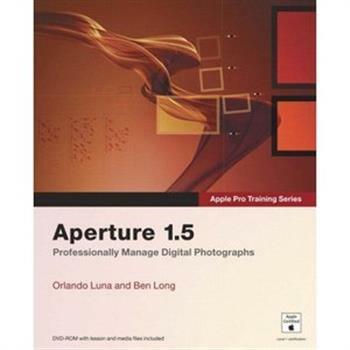 Orlando Luna, Ben Long, Apple Pro Training Series: Aperture 1.5 | Free eBooks Download - EBOOKEE! Posted on 2013-05-26, by thiensutinhyeu13. Now fully updated for version 1.5, this comprehensive book-DVD combo starts with the basics of image management and takes you step by step all the way through Aperture's powerful photo-editing, image-retouching, proofing, publishing, and archiving features. Version 1.5's new features are completely covered, including the new image editing tools, expanded search capabilities, new Loupe tool, and support for many more RAW file formats. No comments for "Orlando Luna, Ben Long, Apple Pro Training Series: Aperture 1.5".